THE BASICS OF CORK TAINT – WHAT IS “CORKED WINE”? Two pretty good articles dealing with cork taint, or “corked” wine came up in my Twitter feed (@JimLockardWine) today. I thought I would post about them here and give you the necessary links. There is also a connected post about the top six wine faults that you will find interesting as well. Corked wine is a fairly common problem, but like all wine problems, a very small percentage of wine bottles will be corked. The Cellar Insider (LINK) puts the number somewhere between 3 and 8%, which means that if you drink from 200 bottles a year, you will encounter 6 to 16 corked wines. Not all wine that is corked is obvious, and the blog post from Wine Folly (LINK) speaks to that issue. Sometimes, the effects of the bad cork are subtle and not noticed. Trichloroanisole or TCA is a natural compound most-generally found in wood that has been in contact with some form of chloride chemical. When Chlorophenols, molecules found in certain pesticides and wood preservatives, get in contact with wood, they can be transformed by fungi into TCA and other bad smelling agents. Because most of the wood surrounding us is treated with preservatives —so it doesn’t rot— the contamination comes from anywhere. If a contaminated wood gets anywhere near wine, the bad odours concentrate into the wine until it may eventually become ‘tainted’. There isn’t much you can do about corked wine – send it back if in a restaurant; return it to your regular wine retailer for a replacement; maybe give everyone present a lesson in what corked wine smells and tastes like before you pour it down the sink (it isn’t harmful to drink, just either nasty or flat and favorless). The blog posts speak more about this. The Social Vignerons blog gives more details on each of these and how to reverse them, if that is possible. Faults in wine are more common the more wine you drink. It is important to learn how to detect these faults and what you can do about them. Many thanks to Julien Miguel (@JMiguelWine) at Social Vignerons.com (LINK) and to Madeline Puckette (@WineFolly) at WineFolly.com (LINK) for the great educational work they do. Feel free to share this post with others who may be interested. This article (LINK) from WineFolly.com, has some very good information about decanting and serving wines. 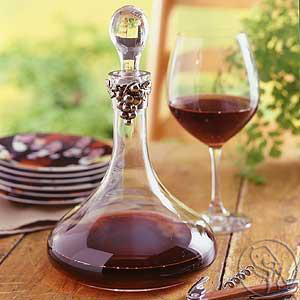 Decanting, and how long to decant, is often a mystery, and this article gives some good guidelines. There is very little about wine that is exact, so I recommend that you see these as guidelines, then explore and make changes as your experience dictates.